Patterns and trends - figure them out and perhaps you can predict the future, right? Note: Sunvest is relatively new to the OTCMarkets. The chart figures above are referring to its TSX listing, SSS. What we’re seeing tonight could be epic as Sunvest is near 52-week low levels - if we see a volume spike and bounce from here it could translate to monstrous percentages! Recent 43-101 compliant based on an open pit application, estimated Inferred Resources of 4,957,000 tonnes at a grade of 1.50 g/t Au for a total of 239,100 ounces of gold! That’s $310,830,000 valued at today’s price of $1,300. And that’s just on one of the company’s several properties. Sunvest Minerals Corp is an exploration stage company. The company is in the process of exploring and developing its resource properties. Its project portfolio includes McKinnon-Hawkins/Hemlo West, Evening Star, Clone Gold, Roy Mine, and Brazil Lake Cobalt Projects. egin to climb, in fact gold prices are forecast to rise further against the US Dollar in 2018 and could peak at $1450 per ounce according to many leading analysts. This makes SRKZF’s flagship project- the McKinnon-Hawkins Gold Property located in the Hawkins and Walls Townships, Sault Ste. Marie & Porcupine Mining Divisions, Ontario all the more important. The property covers three claim blocks comprising 5,824 hectares (58.24 sq km) featuring over 30 kilometers of favorable geology prospective to host gold mineralization. The McKinnon Property, staked by Don McKinnon Sr. of Hemlo fame, with an NI43-101 inferred resource of 239,100 ounces of gold - current, recent 43-101 compliant based on an open pit application, estimated Inferred Resources of 4,957,000 tonnes at a grade of 1.50 g/t Au for a total of 239,100 ounces of gold. It should be noted that SRKZF’s projects are also in areas that big name gold producers are currently operating. Their McKinnon Hemlo West property comprises 5 claim blocks covering a total of 24 claim units (384 hectares). The northern portion of the property is surrounded on the west, east and north by Barrick Gold, on strike and approximately six kilometers west of Barrick Gold Corporation's current open pit operation. The northern portion of the property is cut by the Hemlo Shear Zone, the major east-west trending structural feature associated with the gold mineralization. The HMZ is a structural component in all three Hemlo gold mines that have produced over 22 million ounces 1985. Now let’s turn our attention quickly to SRKZF’s Evening Star Property located near Hawthorne, Nevada. And each of these projects have shown tremendous promise as well; details of each project are provided on Sunvest’s website. What makes the current operations of Sunvest so attractive is the optimism from analysts when it comes to the future of gold and cobalt. We have received five thsnd dlrs via a bank wire for the awareness of SRKZF. While there may be no such thing as a “sure-thing” there is little debate concerning the positive outlook for alternative energy sources and the companies capable of delivering the materials necessary to produce these energy sources. 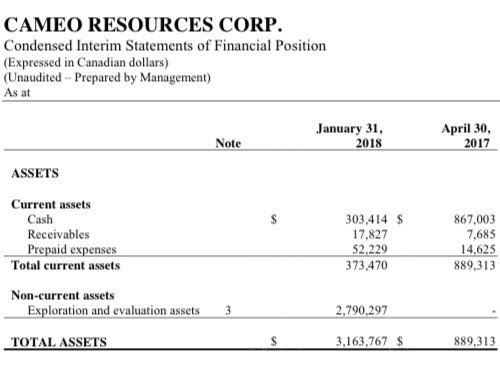 Lets turn our attention to Cameo Resources Corp. (TSX.V: CRU), a company focused on enhancing shareholder value through astute acquisitioning of exceptional projects in perceived undervalued situations. Note the Total Asset growth over the past 9 months from $889,313 to $3,163,767. CRU has been strong for much of 2018, climbing from a low of $0.50 on January 2nd to a high of $1.35 on March 14th. Since hitting that high CRU slid back to the $1 to $1.10 range where it seems to have plateaued. On Friday it closed at $1.10 and the chart is showing signs of green. Before we jump into the details of Cameo Resources let’s take a quick look at some staggering market numbers and facts relevant to the company’s projects. We point out these figures and facts out because Cameo Resources has multiple projects involving Lithium and Cobalt- both of which are necessary components in the current lithium ion battery revolution. Most recently CRU announced they had submitted an exploration permit application to carry out certain exploration activities on their newly acquired Gochager Lake Copper-Cobalt-Nickel project. Once the applicable exploration permit is approved, CRU will immediately relocate a drill rig to the property and begin with the spring exploration campaign. As pointed out in the March press release the Gochager Lake Copper-Cobalt-Nickel Project consists of four claims covering 3,759 hectares and is located in northern Saskatchewan approximately 75 km north of the town of La Ronge. Historical exploration has identified a semi-massive and massive Ni-Cu deposit withsignificantly elevated levels of Cobalt, a vital component in the manufacture of the latest generation of lithium ion batteries. The Gochager Lake Copper-Cobalt-Nickel project has reported grades of up to 3.92% Nickel, 0.70% Copper and 2.86% Cobalt as reported by the Saskatchewan government. Akash Patel, President of Cameo sums up the company’s optimism surrounding this metal, "Cobalt prices are trading at 10-year highs, as demand continues to surge and very little supplementary supply to compensate has emerged. The demand for battery metals appears to be at the beginning of long-term bullish cycle. Cameo continues to tactically position itself for the enviable stampede to secure sustainable energy metal deposits. Recently, Apple Inc. announced it is in negations to purchase cobalt directly from miners with sustainable supply chains and legitimate extraction practices. Cobalt is a critical ingredient in lithium-ion batteries that power Apple's iPhones, iPads, Apple Watch, and MacBooks. The Company is very much excited to have secured a cobalt project with such a high degree potential to capitalize on this megatrend." It’s important to note that CRU is more than just the Gochager Lake Copper-Cobalt-Nickel project. In fact they have multiple projects and earlier in March they filed an NI 43-101 Technical Report for their Silver King North Project, located south of Houston, BC and is contiguous with the Silver Queen Project owned by New Nadina Explorations Ltd. It consists of two blocks containing 14 mineral licenses covering more than 16,273 ha (40,194 acres). In addition to a property border with New Nadina, the Silver King North Project also shares contiguous claims with publicly traded Tasca Resources Ltd. and most recently Resolve Ventures Inc. In addition to their Silver King North Project the company also has multiple projects involving Lithium, projects that have revealed significant levels of the metal. I mentioned earlier the positive outlook for alternative energy sources and followed that with some very impressive facts and figures supporting that statement. What’s clear is that lithium ion batteries are a driving force in this alternative energy sector with lithium and cobalt integral components to these batteries. Recognizing the potential in this market CRU has carefully identified and pursued multiple projects involving lithium and cobalt, projects that have already shown significant levels of these two metals. As more and more countries adopt policies in favor of alternative energy sources the demand for lithium and cobalt will continue to climb. At the moment CRU has positioned themselves favorably for the future and now could be the perfect time to take a close and serious look at the company. For additional information on Cameo Resources (TSX.V:CRU) feel free to visit the links included within this profile. If you have not done so yet, please do your research on TSX.V:CRU right away and enjoy. We have not received any form or compensation for the awareness of CRU. We have previously received ten thousand dollars vis a bank wire for the marketing and awareness of CRU which has since expired. We have never hidden the fact that we love lithium companies, and why wouldn’t we? These companies are fueling one of the greatest revolutions the world has ever seen and there is no slowdown in sight as the applications for lithium continue to create new markets with ever expanding values. Far Resources Ltd. (FRRSF) just reported that initial drilling intersected wide zones of spodumene in Dyke 1 on their Zoro Lithium Property near Snow Lake Manitoba. Now we’ve seen first hand what can happen when positive high-level lithium results are reported – they can send a company flying high! Important: According to the Fraser Institute, Manitoba- home to FRRSF’s Zoro Lithium Property, is ranked as the world’s second best jurisdiction for mining investment. That’s more than 159% growth in FRRSF’s Assets in just 6 months. Seems like FRRSF isn’t simply in the world’s #2 mining jurisdiction, they’re flourishing there at an alarming rate! What does the Breaking News mean? As we speak there is a massive gap in lithium supply vs demand - potentially a $30BLN gap – that is being filled by small mining companies new to the lithium game; and any time a Small company finds itself in a Big situation... well, that pretty much exemplifies the companies we search for. If you want to know the potential for Lithium consider these two names: Elon Musk and Warren Buffett. Musk just sent a rocket into space. Not figuratively, the guy literally launched a rocket into space. What does this have to do with lithium? Well the man has essentially staked his company’s future on the metal; Tesla Motors will require a massive amount of lithium to power their electric cars. We’re just saying, a guy that can see a rocket launch through from dream to reality may have a pretty good idea of where the future of transportation is going and what will be required to get there. Enter Warren Buffett, a man revered for his market sense and personal fortune. Buffett happens to be a major investor in one of Tesla’s main competitors, Build Your Dreams, a Chinese battery and electric car maker. What this means is Buffett is a major believer in Lithium as well and consider this, China has followed in the footsteps of countries like India, France, Britain and Norway, having announced their intention to ban the production and sale of vehicles powered solely by fossil fuels. Again, this means more lithium is needed. It goes without saying, tonight we have our eyes laser focused on a company determined to fill that lithium supply demand. As promising as yesterday’s news was there was another piece of news released by the company last week that could deliver even greater results- FRRSF entered into a binding letter agreement with 92 Resources Corp., TSX.V: NTY to acquire up to a 90% undivided interest in the Hidden Lake Lithium Property, Northwest Territories. The Hidden Lake Project consists of five contiguous mineral claims totaling approximately 1,659 hectares within the central parts of the Yellowknife Lithium Pegmatite Belt along Highway 4, approximately 40 km east of Yellowknife. 92 Resources’ 2016 exploration results returned 1.90% Li2O over 9 m and grab samples up to 3.3% Li2O. Metallurgical test work has produced a high-grade mineral concentrate of 6.16% Li2O with an average spodumene lithium content of 3.8 per cent lithium (8.2% Li2O). Metals and minerals consultancy Roskill Information Services provides a base scenario for lithium consumption at 290,000 tons in 2020. However, that figure rises to a sizably larger 420,000 tons in what it calls its "optimistic" scenario. We could talk all day about how important lithium is in power grid energy storage, consumer electronics, industrial applications, medical, etc… But what everyone tends to focus on remains the most impressive, TRANSPORTATION. FRRSF fully recognizes the opportunities that exist with their lithium projects and this is why they have opted to spinoff of their Winston gold property, located in the Chloride Mining District of Sierra County, New Mexico, consisting of a group of 16 unpatented claims known as the LG Claims; a group of 4 unpatented claims known as the Little Granite Gold claims and 2 patented claims, namely the Ivanhoe Lode and the Emporia Lode claims. There was a time when the lithium landscape was dominated by less than a handful of companies but those days are gone, the market not only needs but demands more production to continue feeding a revolution dependent upon lithium. FRRSF appears determined to be one of those companies capable of filling the growing demands. Tonight we are turning our attention to one of our favorite lithium companies, a play we brought to your attention in late November after seeing some very promising technical and fundamental developments. There is no arguing with the facts, FRRSF put together a great run for us last time and we are seeing some very encouraging signs that could indicate another solid run ahead. - Shortly after we looked at it in November it hit an annual high of .8702! That’s a gain of 252%! Since rising to that mark, FRRSF slid back into the 40s, where it has been since the beginning of this month, for about the past two weeks. It closed today at just .4215. The plateau could be highly positive and if it has found a base here, a bounce could be in the very near future. - Last time it bounced to .8702. - A bounce back to that level could translate into a 106% gain! And any time there are potentially triple-digits on the table, we’re all ears... and I’ll bet you are too. We’re looking at a ground floor situation that could explode. Make sure you put FRRSF & FAT.CN at the top of your screen right away. Note: Far Resources Canadian issue, CSE:FAT, closed yesterday, Wednesday February 14th, 2018 at $0.52 with over 1MLN in volume. We urge members to take Swift Action, start researching FRRSF right away. As always, we encourage you to do further research. DISCLOSURE: The views and opinions expressed in this article are those of the authors, and do not represent the views of 007stockchat.com. Readers should not consider statements made by the author as formal recommendations and should consult their financial advisor before making any investment decisions. We have received twnty thousand dollars via a bank wire for the awareness of FRRSF. We previously received thirty thousand dlrs vis a bank wire for the awareness of FRRSF which has since expired. only name a few off-hand that have as much direct tie-in: Electronic Arts Inc.
LTD UNSP ADR EACH REP 1 ORD (OTCMKTS:TCEHY). and under-ownership by investors in the broader market. for PC. That continues to be a major driver of the action in the stock at present. that are planned to be in market in early 2017.
cultivating some strong potential for monetization. That nicely dove tails with the company’s recent shoring up on the IP front. competitors shows us that everyone loves games that involve real stakes. Players want to play for prizes. Spectators want to watch matches that matter. brands have been unable to reach." that makes it possible for players and spectators to play games they love for real stakes. Versus Head of Business Development. Matching this outlook, the stock has been positively on fire. This should give a pretty good idea why. We have received five thousand dollars via a bank wire for the awareness of VRSSF. Stockchat LLC has previously received 28,000 dollars for the awareness of THNS from a third party which has since expired. Stockchat LLC has previously received 10,000 dollars for the awareness of SITO from a third party which has since expired. Stockchat LLC has previously received 15,000 dollars for the awareness of OOIL from a third party which has since expired. Stockchat LLC has previously received 41,000 dollars for the awareness of AXXE from a third party which has since expired. Stockchat LLC has previously received 13,000 dollars for the awareness of STVF from a third party which has since expired. Stockchat LLC has previously received 27,000 dollars for the awareness of NGMC from a third party which has since expired. Stockchat LLC has previously received 8,000 dollars for the awareness of NPWZ from a third party which has since expired. Stockchat LLC has previously received 4,000 dollars for the awareness of LIVE from a third party which has since expired. Stockchat LLC has previously received 14,000 dollars for the awareness of DRMC from a third party which has since expired. Stockchat LLC has previously received 15,000 dollars for the awareness of ETBI from a third party which has since expired. Stockchat LLC has previously received 60,000 dollars for the awareness of DIGX from a third party which has since expired. Stockchat LLC has previously received 15,000 dollars for the awareness of STHC from a third party which has since expired. Stockchat LLC has previously received 7,000 dollars for the awareness of XDSL from a third party which has since expired. Stockchat LLC has previously received 32,000 dollars for the awareness of CMXC from a third party which has since expired. Stockchat LLC has previously received 90,000 dollars for the awareness of XTRM from a third party which has since expired. Stockchat LLC has previously received 40,000 dollars for the awareness of FLSR from a third party which has since expired. Stockchat LLC has previously received 14,000 dollars for the awareness of VMRI from a third party which has since expired. Stockchat LLC has previously received 23,000 dollars for the awareness of PSID from a third party which has since expired. Stockchat LLC has previously received 40,000 dollars for the awareness of TPHX from a third party which has since expired. Stockchat LLC has previously received 5,000 dollars for the awareness of PMCB from a third party which has since expired. Stockchat LLC has previously received 47,000 dollars for the awareness of AXXE from a third party which has since expired. Stockchat LLC has previously received 5,000 dollars for the awareness of SPYR from a third party which has since expired. Stockchat LLC has previously received 48,000 dollars for the awareness of EWRC from a third party which has since expired. Stockchat LLC has previously received 46,000 dollars for the awareness of TPHX from a third party which has since expired. Stockchat LLC has previously received 6,000 dollars for the awareness of UMAX from a third party which has since expired. Stockchat LLC has previously received 13,000 dollars for the awareness of TXHD from a third party which has since expired. Stockchat LLC has previously received 6,000 dollars for the awareness of RLTR from a third party which has since expired. Stockchat LLC has previously received 10,000 dollars for the awareness of VPLM from a third party which has since expired. Stockchat LLC has previously received 10,000 dollars for the awareness of PFHS from a third party which has since expired. 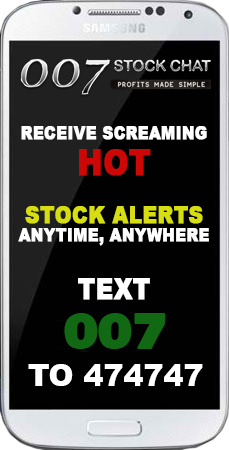 Stockchat LLC has previously received 6,000 dollars for the awareness of FZRO from a third party which has since expired. Stockchat LLC has previously received 7,000 dollars for the awareness of BWVI from a third party which has since expired. Stockchat LLC has previously received 14,000 dollars for the awareness of AMFE from a third party which has since expired. Stockchat LLC has previously received 6,000 dollars for the awareness of SIMH from a third party which has since expired. Stockchat LLC has previously received 9,500 dollars for the awareness of VTMB from a third party which has since expired. Stockchat LLC has previously received 16,000 dollars for the awareness of SBFM from a third party which has since expired.